Will Liberia’s “Iron Lady” Contain Ebola Outbreak, Get Her Country Back On Track? As media coverage switches gears to follow the plight of the American doctor rushed home for treatment, Liberia continues to struggle with its worst Ebola outbreak ever. The Centers for Disease Control in Atlanta called it “unprecedented,” enacting a Level Three warning, admonishing Americans to avoid non-essential travel there. In response, Liberian President Ellen Johnson-Sirleaf adopted strong measures to contain the spread and reassure the people, but fear spreads faster than the virus itself. Can Liberians regain control of the outbreak. Also important, can Liberia maintain the fragile democracy built in the last several years? Ebola virus first appeared in 1976 in Sudan and the country then known as Zaire, now known as the Democratic Republic of Congo. According to the CDC, three separate strains of the virus exist. Two can infect humans. Humans and other primates are susceptible to infection by the virus, which usually leads to viral hemorrhagic fever. Mortality rates are very high, but transmission can only come from direct contact with secretions from an infected person. Since February over 800 Africans, including over 200 Liberians, have died from the disease, which spread to neighboring Guinea and Sierra Leone. What has made this outbreak so unnerving is the infection rate among health care workers. Liberia’s Daily Observer reports that the St. Joseph Catholic Hospital in Congo Town lost its chief administrator, Dr. Patrick Nshamdze. Liberian Ebola expert Dr. Samuel Brisbane died last month. American doctor Kent Brantley contracted the virus and has been flown back to the United States for treatment. The outbreak has put severe strains on a West African nation still working to build democracy and development after many years of misrule. Current president Ellen Johnson-Sirleaf won election in 2005, two years after an American intervention requested by the Economic Community of West African States (ECOWAS.) Liberia suffered for over 20 years under a series of dictators starting with Samuel Doe and ending with Charles Taylor. Doe and Taylor followed the “Big Man” model of African national leaders, combining corruption and violence with inept governance. Additionally, intermittent civil wars claimed the lives of over 250,000 people, collapsed the economy, and ruined infrastructure. Violence, like the current Ebola outbreak, spilled into neighboring countries. Instability also lured the interest of terror supporting states, such as Moammar Ghaddafi’s Libya. Contending groups wanted power and control of the regions riches. Although some media reports suggested that Al Qaeda used Liberia’s illegal diamond trade to bankroll its terror, the FBI did debunk these stories. American success in Liberia remains largely unremembered by history, overshadowed by the Iraq War that started the same year. After taking office, President Johnson-Sirleaf’s government had to rebuild a shattered nation. Liberia’s “Executive Mansion” website details her previous posts of responsibility, record of opposition to Taylor’s regime, and accomplishments as president. According to her biography, she attracted $16 billion in international investment, expanded the budget from $80 million to over $670 million, and negotiated billions in debt forgiveness from the United States. The Liberian president was questioned last year about the lag between Liberia’s economic growth, particularly in petrochemicals, and construction of roads and schools. She gave a Thatcheresque answer, starting with “Perhaps you’re not fully informed.” She went on to explain the “time lag” between “when you mobilize investments” and when the nation finally realizes benefits in jobs and national revenue. Liberia also has been praised for advancing human rights in fields such as religious freedom, while reducing child mortality rates. But now comes a crisis that can shake not only a presidency, but a nation, to its foundations. The Iron Lady of Liberia must confront the pale horse. In the past month, however, Liberia has taken almost unprecedented steps to contain the disease. All but a handful of border crossings are closed. Those still in use have instituted screening procedures. Soccer games were cancelled two weeks ago. Last week, Liberia shut down schools and moved toward the possible quarantine of entire communities. Fear has gripped Liberia, especially health care workers who have seen their own die horribly. 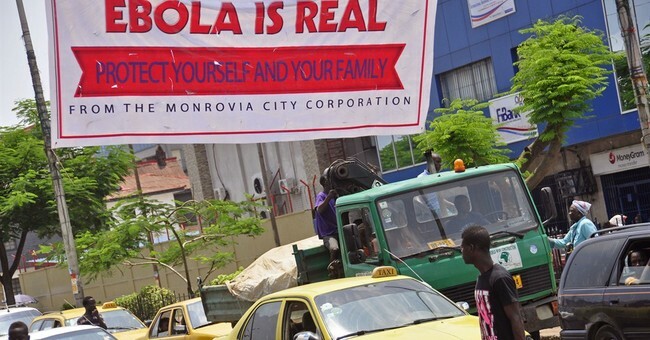 Yahoo News reports that two men with visible symptoms begged for help in the streets of the Monrovia district of Clara Town. Residents fled in terror. They “both dropped dead on the ground in the streets” and lay there untended for days. Also, hospitals have turned away patients and that planned graves for the dead are yet to be dug. Some terrified Liberians blame the government. Two weeks ago, a Liberian whose sister had died from the disease tried to burn down the national health ministry building. As the more stringent measures took hold, Liberia celebrated its 167th year of independence. In a speech marking the occasion, President Johnson-Sirleaf recounted not only the Ebloa tragedy, but other setbacks for her country. Downward turns in rubber prices and exchange rate issues serve as reminders of how much Liberia depends on international markets. She also said “as unfortunate as these are, we still have a lot to be thankful for.” Liberia did expand mining and agricultural operations while also qualifying to participate in US backed international programs. The short speech wrapped up with another list of measures to throw against the disease, sorrow for victims, and a ringing call for national unity. Only time will tell if her Iron Lady rhetoric can rally her country. Liberia has a special relationship with the United States dating back to its founding by freed slaves, mostly from Virginia and Maryland. American power helped to ensure that Liberia did not fall into European colonization as much of the rest of Africa. If President Johnson-Sirleaf can continue to count on inspiration from our free society and strong support from Americans during this trial, Liberian democracy can survive even this deadly challenge.